So adding a custom style of max-width: 100% on the .owl-wrapper looks to be the solution we want! Moving on from here, perhaps we could looking a bit more into what is creating this owl-wrapper in the first place: e.g. is it a library that just needs proper configuration or is there an actual bug in the library. But that would possibly be something for another day! This month we held the meetup at iCentre thanks to the folks at DARe! That seemed to be fixed with a max-width: 100% definition. Full write up of investigation and ways to check and fix it to come soon! 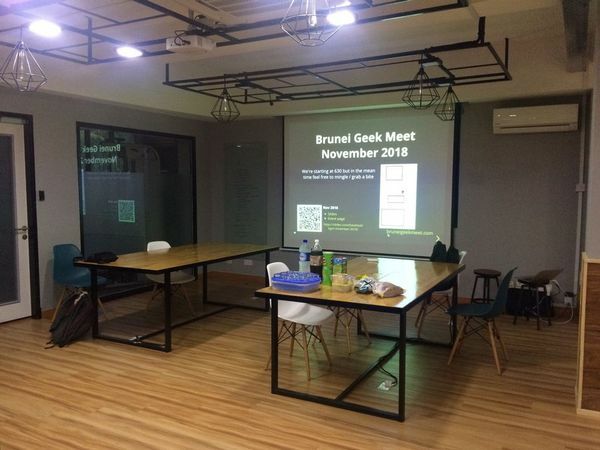 Intro slides for the night which include upcoming tech related events happening in Brunei! So I hope you come and join me on this #fixBruneiWebsites journey! It is the month of October and Hacktoberfest returns yet again. If you’re not aware of what Hacktoberfest is, it is month-long celebration of open source software run by DigitalOcean in partnership with GitHub and Twilio. This being the second year of participating in Hacktoberfest, I’m going to try look at tools I use or projects/people that have added value to me in some form over the many years of the Internet. So I’ll be continuing my hunt 👀 and hope you guys have a great Hactoberfest! Website synopsis: The government has provided several different platforms by which the public can communicate with various agencies. For example, the E-Darussalam Portal presents users with a forum for individuals to express their opinions and concerns. Several government agencies are also actively making use of social media to interact with the public. To further improve communication, the government needs to increase the visibility, responsiveness, and cohesiveness of the different mediums so as to better interact with the general public. Discussion felt at odds with the synopsis which mentioned the use of social media but hesitation to use it as mentioned in the panel? Website Synopsis: Data.gov.bn portal site was developed and launched in 2014 to promote Open Data. The portal was developed with the intention to facilitate and help the public, business entrepreneurs and researchers to obtain data that are general data that are collected by government agencies, through the portal. To improve the effectiveness and accessiblity of the website, the portal needs to be further developed to enable automation (API access), as well as incorporating dynamic and interactive interfaces to aid in better understanding and interpretation of data by the general public. Website synopsis: The government has provided four (4) separate hotline to receive the emergency calls from the public; ambulance (991), police (993), fire & rescue (995), as well as search & rescue (998). With the availability of the latest technology, the delivery of this emergency information can be further improved so as to allow the proper emergency authority to provide quick & accurate response and reach the emergency location faster. Website synopsis: Through the Ministry of Religious Affairs, the government has recently successfully implemented the Mosque Fund, and may soon see development of its first mosque from the fund. It would be beneficial to explore the expansion of such activities primarily to support the development of social communities and potentially fund national scale projects that benefit the country as a whole. Challenges in this domain include having solution that have the necessary transparency and accountability built in, while enabling funds from various different mediums. Website synopsis: The scale of the obesity epidemic in Brunei Darussalam is staggering. Recent surveys indicate that 33.5% of the adult population in Brunei are overweight and 27.1% are obese. The implications of this for the development of non-communicable diseases such as diabetes, heart disease, cancer and stroke are highly significant and the social and economic consequences are potentially devastating. Without a change, Brunei Darussalam will fail to meet its Wawasan 2035 goal of becoming a top 10 nation for quality of life. Evidence suggests that to combat the obesity epidemic we need to engage individuals and the wider community to take responsibility for their own health. Individual behaviour has to change such that eating healthily, with moderate portion sizes, and doing 150 minutes of moderate physical activity a week to maintain health becomes the social norm. Unfortunately, it is not enough just to raise awareness and educate individuals. We have to move beyond “awareness raising”. Our behaviour is strongly influenced by our environment and the culture around us. In Brunei there is a ready availability and affordability of high calories, nutrient poor foods, alongside a mindset that views over-eating as normal. The task therefore is, how we engage the community, and create a social movement towards healthy living? How do we make healthy lifestyles the new normal and push the message that ‘Health is Everyone’s Business’? Website synopsis: In recent years, a number of talented locals have turned to social media to attract customers and showcase their talents. In order to ensure that this talent can be marketed and has greater visibility, a platform for a talent management and matching may prove beneficial. Website synopsis: Efficient public transportation can form a crucial part of the solution to the nation’s economic, energy, and environmental challenges – helping to bring a better quality of life to those who rely on it. The government is continuously committed to improving its public transportation. Challenges here include improved access to service times for public transportation and routes, and information about delays and official information. Website synopsis: Statistics of tourists visit to Brunei Darussalam has increased from year to year. Last year alone, a total of 218,000 tourists visited Brunei Darussalam which was an increase of 8.57% compared to the previous year. With the increase in this statistic, it can also help Brunei in boosting the national economy. Challenges here is how to ensure that the tourists feel comfortable and safe, while increasing their enjoyment and ease in the country. Website synopsis: The real estate market in Brunei Darussalam continues to grow with several types of housing, property and shops being developed in different locations. To further increase and attract more investors (both local and foreign) a tool that enables them to analyse the market trends based on the data may serve to better decision making and development in areas of demand. They missed the opportunity for the subject matter experts to be available to the participants. Preliminary schedule mentioned that there would be a session in the morning where they would have booths for participants to ask them questions before the afternoon panel discussion. But this was not the case: there was no subject matter experts from each project available in the morning. Theme description on website and what was discussed during the panel session can be different. Not the case for all but from what was emphasized during the discussion, it seemed to diverge from the theme synopsis. Felt that the “Communication Hub” and “Talent Search” projects were the main ones for me here: “Communication Hub” synopsis mentioned of the government utilising social media, but panelist mentioned not wanting to use social media. As mentioned previously the “Talent Search” synopsis made me think along the lines of the creative arts industry. As I believe there were some people who couldn’t make the event, feels that they are “flying blind” not having access the possible more relevant things discussed in the panel session. Some of these have ready made solutions out there (particularly the “Property Guide” and “Talent Search”). Thus it feels that having them as a theme without focus particular unique situations as to why current solutions don’t work, will just be like reinventing the wheel (while a good learning process for people, it wouldn’t really bring anything unique to the table). Some solutions don’t really need a full app like solution and having just an updated website or central source of information is sufficient. Feels that I’m rambling on a bit on this but I do hope for the best of this hackathon and that the projects do see actual real world use. Just from my feeling of the day itself, it felt a bit confusing and I needed to decompress the info out a bit. I fully commend the organisers in getting this out the door and all the best to the contestants! Brunei Petrol Station Map / Minyak Mana? GDG held their DevFest Season 2016 and I was helping to facilitate the hackathon that they had. We tried to focus on some social good apps and the winner was one trying to map open burning areas with crowd soured reporting while the runner up had to do with image processing via a phone to recognise sign language gestures.